This weekend only, playing the "San Andreas Throwback Jobs" Featured Playlist will grant you Double RP and Double GTA$, regardless of whether you win or lose. To take advantage, simply launch GTAV and hit the "Featured Playlist" button on the launch screens, or access it via the "Playlists" section of the GTA Online Start Menu. Look to the skies all weekend for Crate Drops containing exclusive retro t-shirts of four classic radio stations from a time when FM was king. These tees will be up for grabs in Freemode sessions, along with an accompanying trove of weaponry and GTA$ in each Crate. And for those who'd like to recapture that 90's west coast radio vibe, check out compilations of these and other San Andreas radio stations (as well as other titles in the Grand Theft Auto legacy) available via Spotify and iTunes. Complete the GSF look while you're hanging with your Crew thanks to 50% discounts on all green clothing items as well as 50% off BMX bikes, bandanas and other accessories. Also get 25% off lowered suspension vehicle mods, so you can roll around Strawberry like a true Sunday Driver. Whether it's repping outside the Cluckin' Bell in Davis or catching some air off Mount Chiliad, capture your San Andreas homages in a Snapmatic shot this weekend and you could win a retro prize pack courtesy of Rockstar Games. There are five packs up for grabs, each containing a San Andreas themed Basketball, Bandana, special 10th Anniversary tees, Playing Cards & Poker Chips, the Kubrick Box Set, and stickers. To enter, simply tag your best shots #GTASanAndreas on Social Club. Official Rules here. 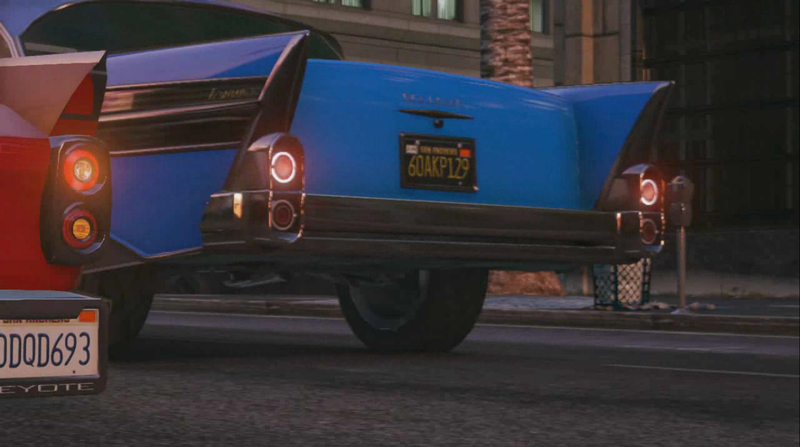 Rockstar will also be playing through the aforementioned San Andreas Throwback Jobs Featured Playlist with the Social Club members who created them and other friends from Twitch and YouTube on Friday, October 24th - starting at 4pm ET. The session will be streamed live on the Rockstar Games Twitch channel. Reminds of SAMP... Oh wait, I still play it..! 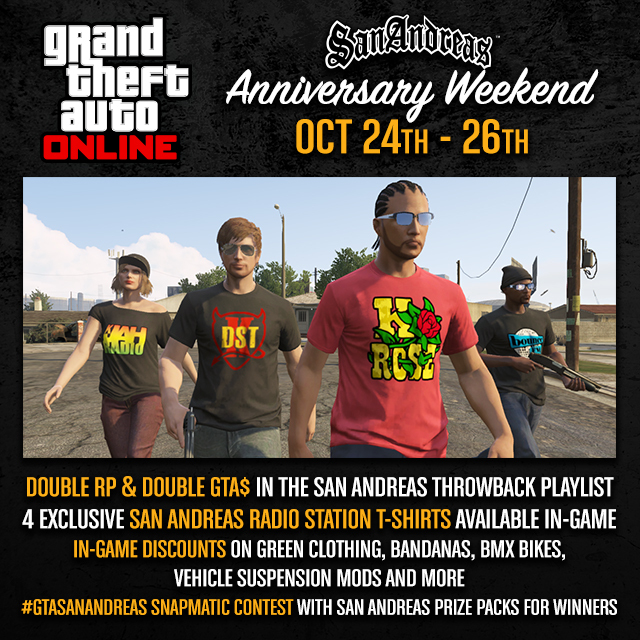 San Andreas 10th Anniversary Weekend in GTA Online - Bonus RP, contests, and more in honor of the 10th anniversary of GTA San Andreas this weekend!